Increase your softball or baseball skills and impress your coaches when you practice at our open field batting range. Whether you want to try your hand at hitting softballs over the 300-foot home run fence or when you are in the mood to cream a few baseballs, our batting range is sure to hit a home run. The miniature golf course is open year-round and features fun for people of all ages. We aim to make golfing at our unique 19-hole course—the world’s longest mini golf hole—an enjoyable experience for the whole family. Since 1965, Rocky Gorge Golf Practice Range & Miniature Golf has been satisfying the desires of golf enthusiast of all ages. This “4-Season Golf Fairway” is opened year round. That’s right, the golf driving range is opened all year-Day or Night / Rain or Shine!. At Rocky Gorge 4 Seasons Golf Fairway, we have golf pros on duty who can help with both group and private lessons. Whether you come in a group or prefer to golf alone, we offer something for everybody. Our Golf Range is the perfect place for Birthday Parties, Scouting Events, Field Trips & Corporate Events. Call Now to reserve your spot. 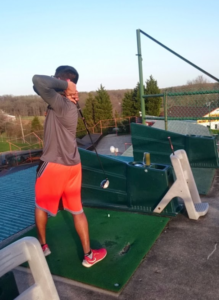 Take the family out for a fun-filled day playing miniature golf or hitting some balls at the batting range at Rocky Gorge 4 Seasons Golf Fairway, a golf range located in Laurel, Maryland. Whether you want to try your hand at hitting the softball or getting a hole-in-one, you and your family are in for a day full of entertainment and fun. My go to spot for a lil putt putt, and driving range. Haven't tried the batting cages so I can't speak on that. But if you wanna flex your manhood on a pretty gd putt putt course, check this place out. I love golfing, especially shooting golf balls from up high. It's a wonderful experience and a good time.